One thing led to another and eventually the possibility of a partnership effort in selling them arose and was briefly discussed, but then the emails stopped. I sent one one more.. again no response, which led me to conclude it was a lost cause.. However, last week I was thrilled to hear back from him..
" ..$3/hour for audio CDs in our standard storage case complete with artwork and $1.50/hour for 192kbps mono MP3s... "
So that comes out to $111.00 for the CD set, or $55.50 for the MP3 version set. (if my calculation is correct). But here's the catch.. 25 sets must be sold and prepaid in advance. Once there are a minimum of 25 sets sold, then Radio Archives will manufacture and ship the sets. Then 3 to 6 months later a second batch may be made available with no minimum number needed. The set will be ordered through the Radio Archives website via a special link payable via MasterCard/Visa/AXP/Discover/PayPal/Check or money order. Per our agreement, I handle all sales and 'Radio Archives' handles all manufacturing and shipping. It will only be available through me, and will still not be listed or available directly on the Radio Archives website to the public. I am also building a website to house the offer. I am currently awaiting further information from Tom of Radio Archives to initialize this offer. I certainly hope selling 25 sets will not be a problem. Surely there must be 25 people out there who would desire to own the best quality set of Quiet Please available anywhere! Interested parties please respond to this post! I misunderstood Tom about the prepayment, actually what is required is that 25 set need to be ordered before going in to production. "Yes, 25 sets sold. I don’t see any reason that customers need to pre-pay. If the minimum of 25 orders don’t come in we don’t want to spend all the time refunding prepayments." I just wanted to update that information now to clear things up. I'm surprised there have been no comments at all here yet concerning the availability of this set.. Surely I am not the only one interested...? I would be interested but would like to hear some samples of the restoration first. Then I could make a decision. Illoman, I had suggested the same thing - if he could supply some 1 minute samples of the episodes then potential buyers wouldn't be flying blind about what they are purchasing.. But his reply to me was basically that they have their hands full enough at the present with making ready numerous new audio books and etc. 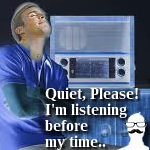 every week ,and he didn't feel particularly inclined to use man hours and pay to ready a selection of audio samples.. I agree with you, but Tom expresses that it would be out-of-the-way to accommodate the request. Radio Archives version of series though less noisy, still exhibits crackle and pops, and the big advantage to them are a notable increase in the audios fidelity. I have not heard any of the episodes myself.. Not so far as I know.. But any improvement would be a welcome one to my ears. Hiya. I'm wondering if anything came of this, because I for one would love to be able to listen to a restored version—I've got a hearing disorder that means I can't make-out the words at all in the old recordings. Only 3 people expressed any interest. I;ve since began to wonder if their copies have already made its way as available on the internet and is the source of the mp3 cds you can buy on ebay and elsewhere.. In other words, maybe the "restored" version they sold a decade ago is not really so much better sounding then what is readily available now... I really don't know, since I've not heard it to compare. Only someone who actually owns their set would know. Unfortunately Paley does not currently permit copies for the public. They are the only potential of restoration from the source disc for the Quiet Please series, but they exhibit no intention of doing so, nor will work with any external professionals to have it done. Nor for that matter do they make any copies of the episodes available to the general public, not even the 3 "missing episodes" they posses. .......I've got a hearing disorder that means I can't make-out the words at all in the old recordings. It's a shame that everyone who has good audio copies or missing episodes seems determined to fiercely guard them instead of share them. I can't begin to imagine how much other history we've lost to such attitudes.